FlexibleDashboard+Liferay is an open source BI dashboard app / framework which supports dashboards layouts (user/group) managed in Liferay that can mix pure Flex FlexibleDashboard pods and regular Liferay portlets. This used to be called FlexibleLiferay when it was only a Flex portal container / Liferay front end app for portals with only regular Liferay portlets. Placeholder “flexpod” portlets from the “FlexibleDashboard+Liferay” category can be added to a page/tab in the regular Liferay web UI, to configure BI dashboards. Then in the FlexibleDashboard+Liferay Flex/AIR app the appropriate FlexibleDashboard Flex pod will be displayed instead of a portlet. A Flex pod means its a pure Flex module being displayed without being wrapped in a portlet / HTML. All these FlexibleDashboard Flex pods are supported: bar/line chart, pie chart, grid and grid/chart with Spring ActionScript config of BlazeDS data sources, BIRT report, JasperReports report, OLAP pivot grid / XMLA query tool, Pentaho charts, calendar, local files, and HTML. Current limitations: pod.xml file configures on a portlet basis, would be better to have configurable properties on a portlet instance basis. Also module SWF files load from the Flex/AIR app dir, not from portlet web app dirs. FlexibleDashboard, an open source dashboard project for BI dashboards/mashups, etc., now has a Flex Mobile AIR version in addition to Desktop (Desktop AIR and Flex in browser) versions. An Android build is available for download, and the iOS version can be built from the common source. FlexibleDashboard used the esria dashboard as a starting point and evolved it with added flexmdi cascade/tile (esria pod drag/drop in tile mode), more pods, both Flex in Browser and Flex+AIR versions, port from Flex 3 to Flex 4, and pods in separate Flex modules. Example pods using Spring ActionScript to have different configs for individual pods and config of a simple IDataService with either SOAP, XML, or RemoteObject BlazeDS datasources (see GridPod and ChartGridPod) were also added. FlexibleDashboard has the following pods: esria charting pods with quietly scheming animation (line, bar, pie charts), JasperReports viewer, BIRT Report viewer, OLAP pivotable grid with XMLA datasource support and MDX query editor (from Grebulon sourceforge project), Pentaho Charts sample, a simple BlazeDS data pod, Flex SWF pod, Calendar, HTML viewing (IFrame, AIR HTML, mobile StageWebView versions), and some AIR only (Desktop and Mobile) pods (HTML browser, Google gadgets, Liferay portlet widget, and Local Files browser). For mobile, only the bare minimum was done: pod min/max/close button hit areas was increased and mobile versions of pods displaying HTML were created (the snapshot feature of the flexcapacitor WebView Flex UIComponent StageWebView wrapper helped to support cascading mode html pods with only the topmost being in StageWebVeiw mode and the other being in bitmap snapshot mode.) Other pods were unchanged and don’t have mobile specific UI (but stuff still works, even mx chart drill down with touch). Also, the original app projects were split into separate app / library / modules projects to facilitate sharing with the new mobile app / library projects. It took an error message on iOS about not being able to load module SWF (Duh!) to get me to change the mobile project to link pod code instead of loading modules. Android Mobile AIR was able to load modules, but mobile Flex app projects in Flash Builder doesn’t have module setup and won’t build the app using framework RSL even though its in the UI. So I ended up just having a single mobile app project for both iOS and Android that doesn’t use modules (desktop AIR and in-browser Flex app projects still use modules). Plan in the future to have some sort of HTML5/JS Dashboard project like FlexibleDashboard (with web app and PhoneGap mobile app variations). 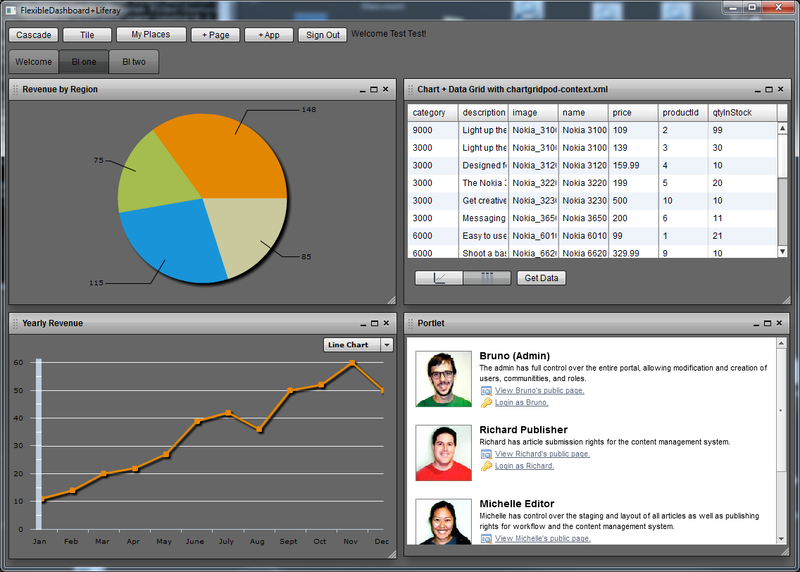 Also plan to add support for semantic data sources / semantic data integration, and more visualization support. FlexibleDashboard is a dashboard application / framework focused on the uses of dashboards for BI / Reporting / Charting. 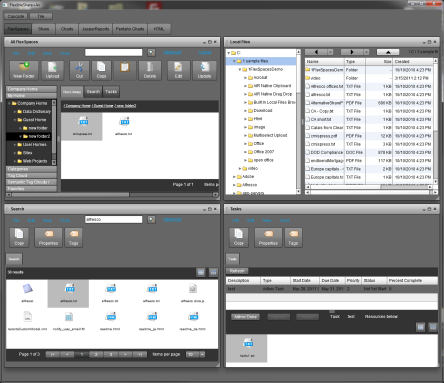 It started with esria dashboard code and evolved from there, adding flexmdi cascading / tiling (esria pod drag/drop in tile mode), more pods, pods in Flex modules, Spring ActionScript configurable pods, and both Flex+Browser and Flex+Air versions. Additional pods beyond the esria charting pods include: JasperReports viewer, BIRT Report viewer, OLAP pivotable grid with XMLA datasource support and MDX query editor (from Grebulon sourceforge project), Pentaho Charts, GridPod, ChartGridPod, calendar, and iframe html. The AIR version has additional Flex+AIR pods: webkit HTML, web browser, Google gadgets, Liferay portlet gadget, and a local files browser. In February, FlexibleDashboard was ported from Flex 3 to Flex 4 in build3, including a first pass of using spark controls instead of halo controls. I got mostly through porting the esria dashboard part, then discovered code by Greg Lafrance (who later wrote a 4 part Adobe devnet series of articles part1, part2, part3, part4) that helped me port the remaining parts of the esria code in FlexibleDashboard. I also used a skin from flexdevtips for pod windows. Instead of porting the full flexmdi code to Flex 4 / spark, all the style setting code was removed, and just the basic parts were ported. In April, build 4 of FlexibleDashboard added having pods built in separate flex modules and instead of having the esria style hardcoded switch on pod type to pod class, the module path is listed in the pods xml files on each pod. Build 4 also introduced having each use of a pod/module configurable separately with Spring ActionScript in a separate context xml file (in src/spring-actionscript/ dir). 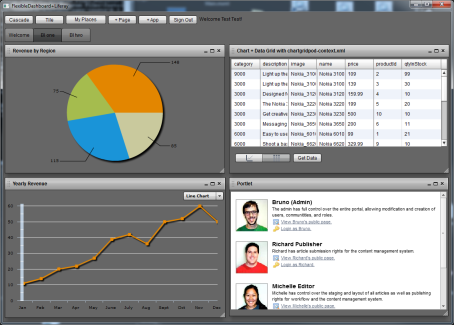 This is currently used in 3 differently configured GridPods and in one ChartGridPod. A similar approach could be used with other Flex frameworks that support modules (Parsley, etc.). The GridPods and ChartGridPod just reference a data service interface IDataService, and the particular data service implementation is configured and injected / autowired with Spring ActionScript. Build 4 also has 3 simple data service class implementations (SoapDataService, XmlDataService, RemoteObjectDataService) which get data via BlazeDS (or from LCDS). The shared ChannelSet for the grid pods is configured in src /spring-actionscript/ application-config.xml The esria dashboard like config is still in data/ FlexibleDashboardPods.xml (or in data/ FlexibleDashboardAirPods.xml for the AIR version). FlexibleShare adds the following to FlexibleDashboard: FlexSpaces pods for Alfresco document management along with Flex based collaboration pod front ends (wiki, blog, calendar, doc lib, discussions) to an Alfresco Share backend. FlexibleShare was ported from Flex 3 to Flex 4 in May. The additional pods are now in Flex modules too. FlexibleLiferay extends FlexibleDashboard to provide a Flex portal container for Liferay. The Flex+AIR client is able to get all of the places/layouts, tabs, and portlets you would normally see as a Liferay portal user and display them using a Flex based container with an HTML control for each portlet (doesnt support pure Flex/Flash portlets yet). The basic idea was for a Flex Portal, instead of starting from scratch, leverage the server side and services of an existing portal. 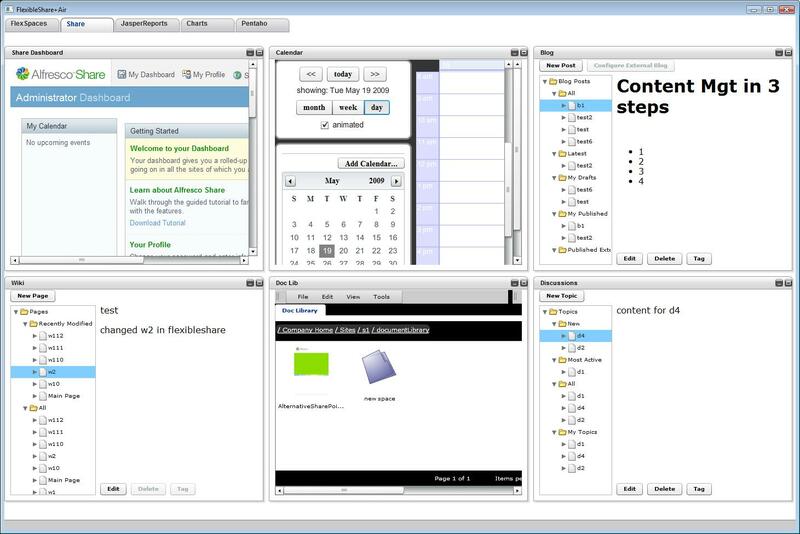 Another use case is for views from an existing portal can be included in a larger enterprise Flex application. Note that FlexibleDashboard and FlexibleShare can also display individual Liferay portlets in a configurable pod using the Liferay widget, just not whole existing portal layouts. Recently FlexibleLiferay was ported from Flex 3 to Flex 4. The server side code was changed from Liferay 5.x ext environment code to a simpler web plugin for Liferay 6.x. The FlexibleLiferay client uses BlazeDS/AMF to remote to Java APIs provided in the web plugin. Built versions of the AIR client and the server piece (web plugin) are now available (previously there was only code available in the svn). A first build and source for FlexibleShare+AIR, an open source, Flex based dashboard/portal container focused on document management (Alfresco, Adobe LiveCycle Content Services ES), collaboration (Alfresco Share), and BI/charting/reporting, is now available on the Alfresco Forge and on Google Code. As a Flex based dashboard for FlexSpaces view pods (doc mgt, wcm, search, workflow tasks), its further along. (Note that the WCM pod is commented out in data/pods.xml). The Charting, Pentaho charting, JasperReports report viewer pods are samples only (additional BI/reporting capabilities to come). Liferay html pod runs the full Liferay portal (no pods for individual Liferay portlets yet). To get FlexibleShare to run on LiveCycle Content Services (8.2.1), FlexSpacesConfig.xml needs to be changed following its LiveCycle comments (different setting for alfresoUrlPart, set isLiveCycleContentService value to true, and set serverVersion to 2.1 to reflect its embedded Alfreso. Also in data/pods.xml comment out the tasks pod, and remove the pods in Share section. Note: for FlexibleShare on LiveCycle on non localhost, currently need to recompile with service-config.xml changed. This will initially focus on Flex+AIR, and later will have Flex+Browser support. Also plan to enable the pods to be used as Adobe Genesis Tiles. (Note: the Flex based pods for Alfresco ECM will support Adobe LiveCycle Content Services ES too). The prototype currently uses the Esria dashboard sample (inside a Flex+AIR application) as its portal container (also looking at the Anvil project to provide more modular support for loading Flex portlets). The first tab in the prototype screencam has pods based on FlexSpaces (Doc Lib, Search, Tasks, WCM, Local Files). The cool thing in AIR is that desktop drag / drop into the Doc Lib and WCM pods just “works”. The Local Files pod takes advantage of AIR apis to access local files and drag / drop from it into the Doc Lib and WCM pods works too. FlexSpaces support for Calais integration semantic tagging is also supported if enabled. This tab has the early beginnings of some Flex UI (blog, wiki, discussions, site doc lib, calendar) for Alfresco Share backend. For the calendar, I am using code based on Ely’s interactive calendar. For the overall Share dashboard and Share site dashboards, using the AIR webkit HTML control to display them (so Ajax Surf dashlets can be used in them). Update: for blog, wiki, discussions, now working on more specific UI instead of FolderViews (instead will have post/comment tree, selected item content viewer pane, etc.) Update: Later will look into pods for individual Surf dashlets. This tab is using a modified version of the flex based JasperReports flash viewer to display jrpxml files. This has left in pods from the ESRIA dashboard sample. These use the Quietly Scheming chart animation effects. 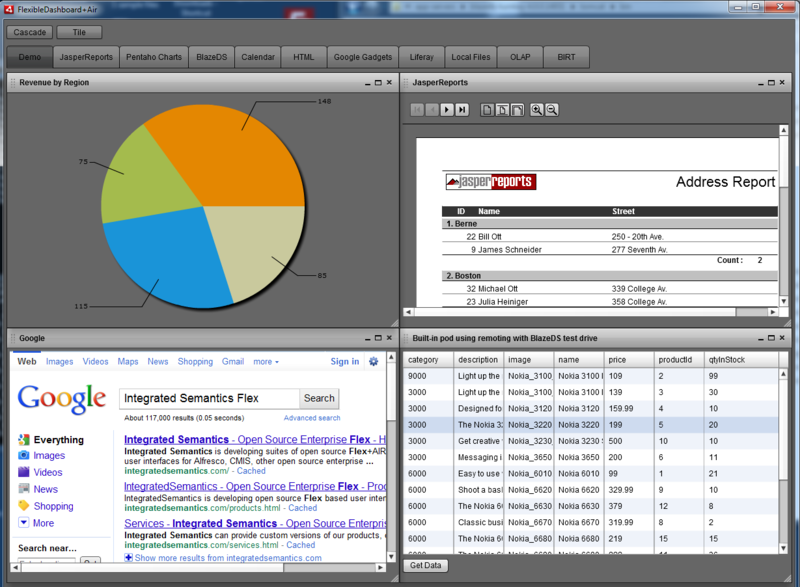 This is based on a Flex version of the Pentaho dashboard sample. This runs Liferay in a AIR webkit HTML control. Update: later will look into pods for individual Liferay portlets.